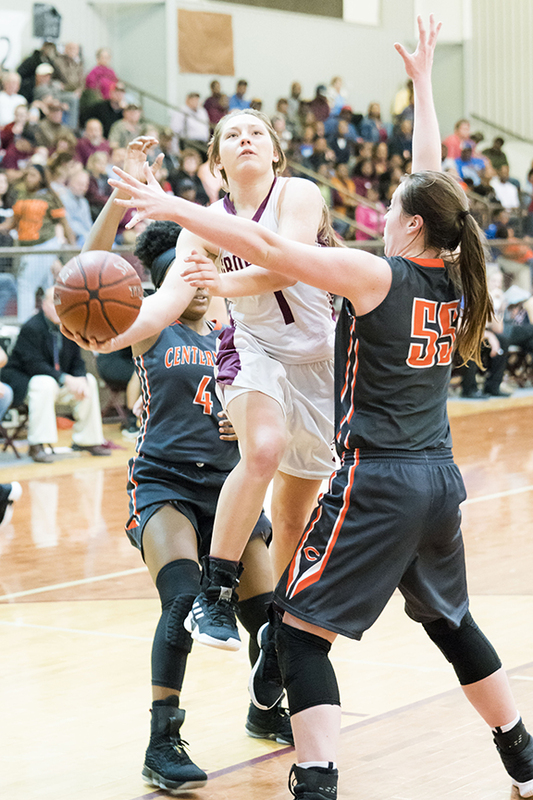 GRAPELAND – For the third time in three years, the Grapeland Sandiettes are the District 20-2A Champions after they defeated the Centerville Lady Tigers by a score of 62-27 on Senior Night in Grapeland. The Sandiettes, ranked at #12, welcomed the #25 ranked Lady Tigers to town on Friday, Feb. 1 and proceeded to show the TABC pollsters that Centerville is way over-ranked and the Sandiettes are under appreciated. Still, flying under the radar may be beneficial to Grapeland as the playoffs begin next week. Ragan Bowie throws an outlet pass during a fast break as the Grapeland Sandiettes defeated the Centerville Lady Tigers, 62-27. The game against Centerville started off with the Sandiettes racing out to a 14-2 lead as Hannah Chipman dropped in seven points, while Teira Jones had five and Tatiyana Bowie had two. The Lady Tigers’ points came on a two from Brittany West. Things didn’t get much better in the second quarter for Centerville as they only managed five points on twos from West and Kinsey Hardee while Averi Hancock converted one of two from the line. The Sandiettes took advantage of the Lady Tigers poor shooting and opened up their lead to 31-7 by halftime. 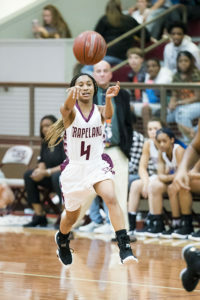 Jones paced Grapeland with eight points while Kenya Woods had four. KeKe Harris knocked down a three-pointer and Chipman added a basket to close out the first half. The third period saw the Centerville offense shake the rust off – a little bit – as they scored 11 points. West went for six in the quarter while Hardee and Hannah Matthews both had two. Nya West made one of two from the line to round out the Lady Tigers’ third quarter scoring. Grapeland extended their lead after the break and saw it balloon to 45-18 behind nine from Jones, a three from Harris and two from Woods. That’s my ball! No, it’s mine! It really didn’t matter as the Grapeland Sandiettes blew out the Centerville Lady Tigers, 62-27, to three-peat as district champs. defense re-asserted itself and held the Lady Tigers to nine points on eight from KK Stevens and one from Trista Brown. Meanwhile, Grapeland salted the game away with seven points apiece from both Harris and Jones, while Tori Woodford hit a three to help give the Sandiettes a 62-27 win and the outright District 20-2A Championship. On the game, Centerville was led in scoring by Brittany West with 10 points and KK Stevens with eight. Kinsey Hardee had four, Hannah Matthews dropped in two and three Lady Tigers – Trista Brown, Averi Hancock and Nya West – all had one to account for the Centerville scoring. Grapeland was led by Teira Jones with a game-high 29 points while KeKe Harris had 13. Hannah Chipman went for nine, Kenya Woods had six, Tori Woodford netted a three and Tatiyana Bowie chipped in two. The win gives the Sandiettes the number one seed out of District 20-2A. They will face the number four seed from District 19-2A. Currently, that would be the Frost Lady Polar Bears, however, the Cross Roads Lady Bobcats could slip in and steal the final spot. Regardless of who Grapeland plays, expect the Sandiettes to win the Bi-District round and advance to Area.